This is Marie’s homemade bar soap that has a lot of acne-fighting ingredients. First, it’s an attractive looking soap. I love the swirly black, gray, and white design. Zinc oxide is an astringent, that manages oily skin and helps the skin to heal. Sea Buckthorn Oil is a highly prized oil that’s usually used to treat damaged skin. Aloe Vera powder has anti-inflammatory properties that help to treat the scars and redness that result from acne. French Green Clay is highly absorbent, cleans the pores, and heals the skin. Marie includes directions on how to make this cold process soap. 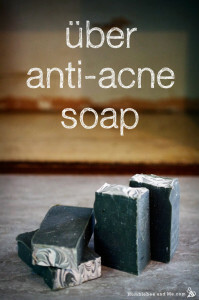 Click the How to Make an Über Anti-Acne Bar Soap link below to see the recipe and tutorial.